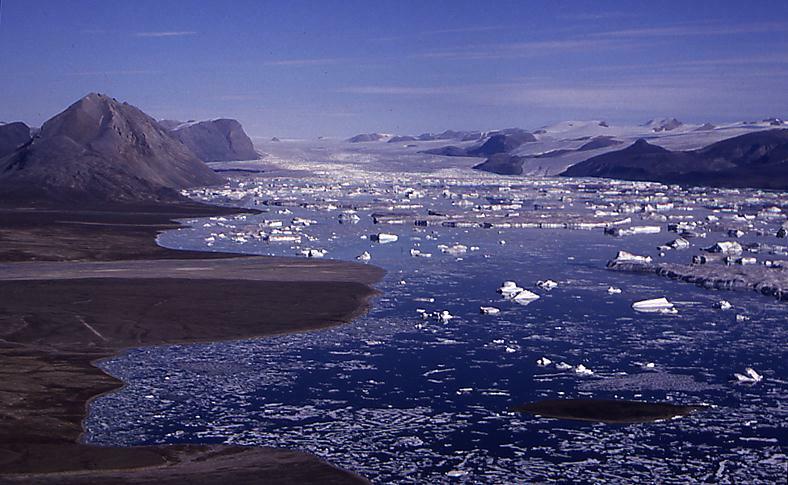 After a week in a camp on Northern Elllesmere Island South of Hare Fiord we would get a camp move. So far the weather was variable, around minus 2 with light snow every other day. 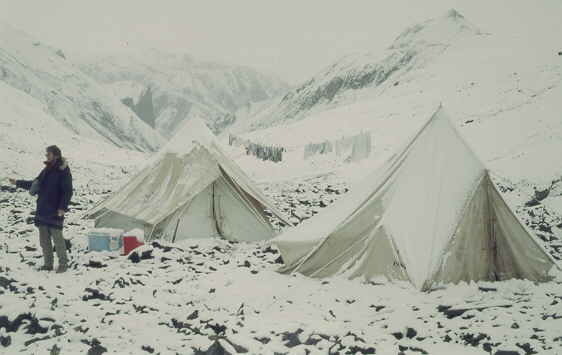 The terrain was fully covered in snow and this summer season of 1989 was the coldest, with permanent snow even at low altitude. The sky was fine, only partially cloudy and we confirmed the flyable weather with the base. The helicopter came a few hours later flown by our Vietnamese pilot I also had the year before. He always called me Van, the first name of Van Berkel and I could not make him call me John. He has been a pilot in Vietnam flying for the Vietnamese government army and experienced many scary situations. When the Vietcong took over, he took his family in a helicopter, flew to an air craft carrier and dumped it in the sea, a common practice. I went on the first of two loads to find the new camp leaving Jeff, my student and field assistant, behind. The weather was deteriorating and we hesitated in the move. Nevertheless, we decided to try it as we could be delayed for days if we stayed. The helicopter followed Hare and Otto Fiord, avoiding the mountain range. Otto Fiord was full of icebergs. The ceiling was low, only 100 m, and the light dim. Flying so low below the grey clouds and seeing the seals that stayed in pools next to the iceberg felt like an Apocalypse. We still had to find the valley going up from the fiord in the clouds, if we would, and felt we were about to see a polar bear. Finally we found the narrow valley indicate on the aerial photographs and slowly moved up. The valley turned out to be the right one and the target camp location was fine for camping with little snow. We dropped the first load and normally the pilot would go back by himself to find Jeff. Now he was unsure he would find the new location again and he asks me to guide him back using the detailed aerial photographs. The weather got worse and it started snowing more heavily. We were just in time to pick up Jeff and drop us off in the new camp, the clouds more and more closing in on the mountain range. When the pilot left, it was snowing steadily with poor visibility due to the cloud cover and we wished him good luck. He would follow the frozen fiords. The next morning when we woke up, the tent was small, bright and cold. Overnight we got 20 cm of snow and the tent had a heavy snow load. Camp on Northern Ellesmere island, after some snow.